In the noble and dangerous times of medieval France, the young knight Aubrey de Montdidier, nephew of the Count of Montargis, has been strangely murdered. His friend the brave Sieur DeNarsac, captain of the count’s men-at-arms, and Thierry, a young page, must now solve the tragic mystery. Yet it is a magnificent white wolfhound by the name of Dragon — Montdidier’s faithful companion — who brings an unexpected, shocking conclusion to the puzzle of his master’s untimely death. 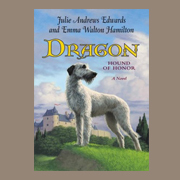 New York Times best-selling authors Julie Andrews Edwards and Emma Walton Hamilton weave a tapestry of intrigue, power, loyalty, and friendship in this novel based on the captivating French legend of Montargis.